These bitterly cold days of late have been making me yearn for warmer climes and I’ve been thinking a lot about the holiday I went on this time last year. It ended up being a very interesting break and confirmed my belief that it’s good to broaden horizons and learn something when visiting other countries around the world. I planned to go away with a friend, and we weren’t 100% sure of where to go. It was (by UK standards) a winter break, and we desperately wanted to feel the warmth of the sun, which meant Europe was not really a viable option. The climate is variable even in southern Europe during March. We were only able to book a week off work, so long haul wasn’t really an option either. After much deliberation, we decided on Egypt. But we were both agreed on one thing: we didn’t want to go on a package holiday. This ruled out Sharm el-Sheikh, resort central and the go-to destination for British travellers on the hunt for a cheap package deal. Dahab has a long history of luring travellers – and trapping them for days or weeks on end – with its cheap ocean-side camps, golden beaches and rugged mountain backdrop. In recent years Dahab has expanded beyond its humble origins, and now boasts a smooth fusion of hippie mellowness and resort chic. And off the beaten track we got. ‘Resort chic’ is probably a description too far. We discovered that as little as 30 years ago, there were fewer than 30 Bedouin families in Dahab. And apparently the town has only had electricity for just over 10 years, so I must admit that at first I was slightly perturbed by where we had chosen to visit, it is a very rugged place. But by the end of the holiday I genuinely wanted to stay longer and learn more about the people and culture that we discovered. To put our initial experience into context, it wasn’t the ideal arrival into any country. Our pre-booked car wasn’t waiting at the airport, but we were greeted to a plethora of taxi drivers who wanted to take us to our destination. Late at night, after all of the other tourists had left the airport and unable to contact our hostel, we had no choice but to get into one of the taxis. Upon leaving the city we came to a road block… with heavily armed police guards… who didn’t speak English. And neither did our taxi driver. It was at this point that I text my husband to ask what the telephone number was for the emergency services in Egypt (but assured him not to worry!). Eventually we were told by someone who did speak English that this was totally normal. Because of the history of roadside kidnappings in the area (!) the government implemented road blocks so vehicles travel through the mountainous region in convoy, rather than individually. Army guards wait for enough vehicles to build up before they let the traffic drive through. After at least 20 minutes of waiting in the dark we were ushered through, along with many other cars and coaches. 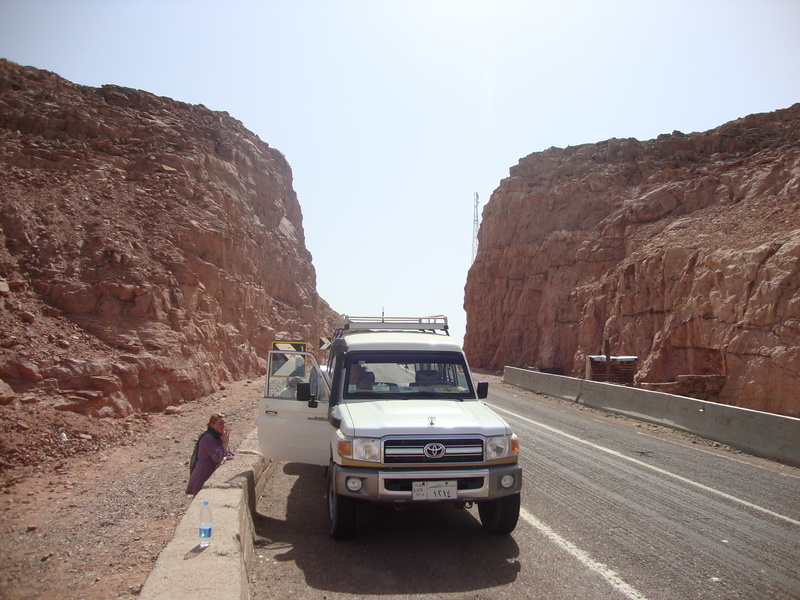 We came to realise throughout the holiday that roadblocks and traffic convoys are part of the daily routine when travelling around the Sinai Peninsular; it is a security procedure to ensure the safety of those driving in the region. We arrived at our destination safe and sound, and as it turns out Dahab turned out to be a fascinating place, for many reasons. Our first impressions were of a very rundown town. There were many unfinished buildings all across the town, foundations and outer shells, as well as old abandoned buildings whose owners had long since left. We later learnt that this building site environment is a direct effect of the global recession, the Arab Spring (political uprising in Egypt), plus (believe it or not) the shark attacks in Sharm el Sheikh. All of these factors combined have resulted in heavily decreased tourist numbers. But behind the shabby appearance you can see the attraction of the town, particularly for travellers who want something more than just a beach holiday. It is very laid back, there are no shiny resorts (not in the centre anyhow) and there are plenty of great restaurants to eat in, right on the seafront. The food was great, with a distinct Middle East flavour, and very reasonable. Although fairly basic, the hostel we stayed at, Bishbishi, was a fantastic base which I would highly recommend: Super friendly, comfortable and relaxed. The service was great, staff went out of their way to make you feel comfortable, which is a lot more than you get in many hotels. It was run by a very charismatic and engaging Egyptian from Cairo, Jimmy (clearly not his Arabic name). Jimmy said that if tourist numbers in the former ‘good’ years of 2010 and before were at 100%, tourist levels when we visited in 2012 were around the 10% mark. Businesses were really struggling, many people in the tourist industry had lost their jobs, and construction firms had abandoned their work. I imagine it is unlikely that these half-finished buildings will ever be built, they will be a constant reminder of these difficult economic times. The local people, despite their current hardship, were incredibly friendly and kind, always happy to stop and chat, to point you in the right direction. Jimmy from Bishbishi went beyond any level of expectation, going out to buy an insect bite cream for us and offering endless cups of tea, all on the house. It was a pleasure to spend time with the Egyptians and learn about their lives. 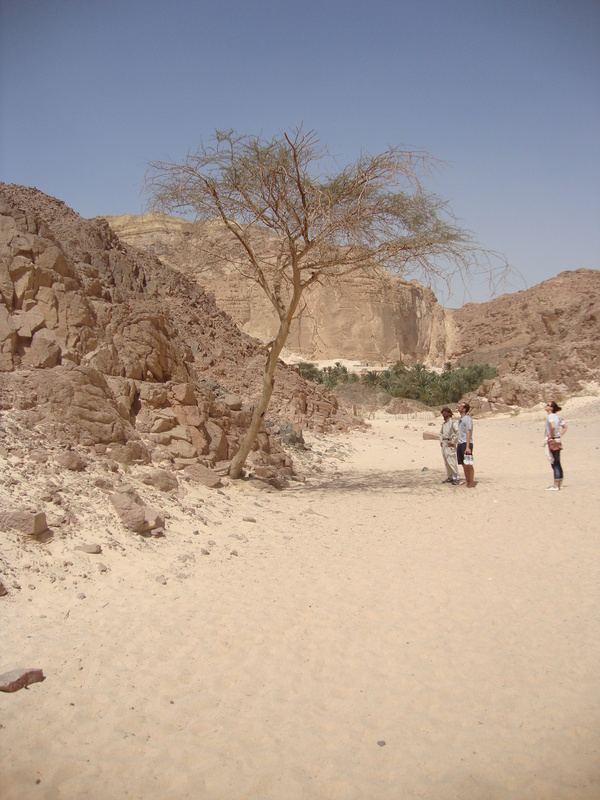 We went on a very memorable guided excursion into the interior mountainous desert region of the Sinai Peninsular. 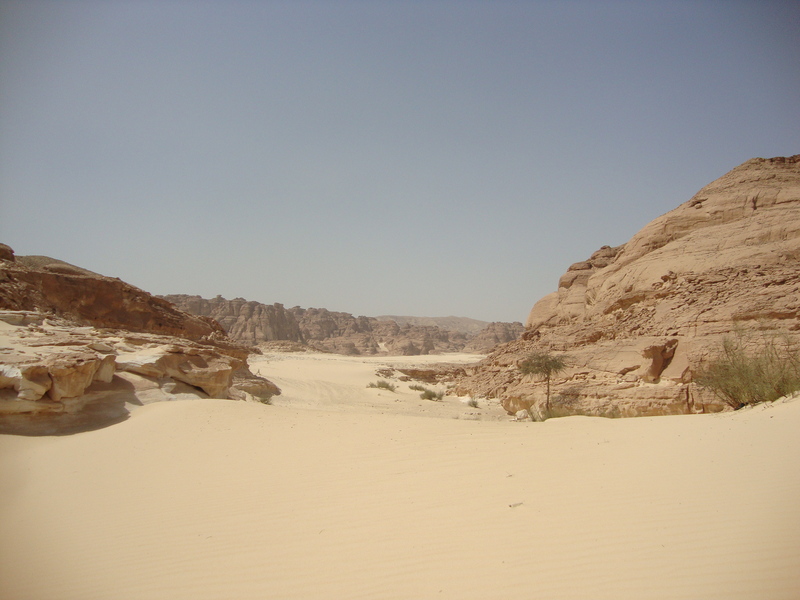 We trekked through the breathtaking ‘white canyon’ and the ‘coloured canyon’, were taken through Bedouin villages and also to an oasis in the desert. It is unbelievable after struggling through the soaring daytime temperatures in such a dry landscape, with little life around, to see are palm trees on the horizon. One negative aspect of the trip however was not meeting, or even seeing, barely any Egyptian women. Locals in the town were 99.9% male. Men work in the shops, cafes, bars and restaurants, men drink and eat in the bars and restaurants, and it was very uncommon to even see a woman passing by. We saw only one or two Egyptian women in seven days, wearing burqas and accompanied by males (presumably their husbands, brothers or fathers). This was a genuine surprise. We had both visisted Morocco, another Arab country, and not noticed an obvious absence of women. It was unexpected to discover that women appear to be ‘hidden away’ in Egypt, which I would not consider to be a hardline Arabic state. 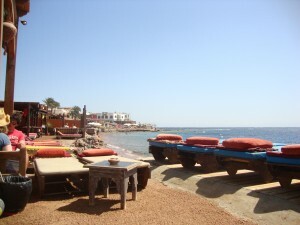 Despite this, I would highly recommend visiting Dahab, and getting off the beaten track in the Sinai Peninsular. Having never been to a desert region, I found the interior mountainous area breathtaking. 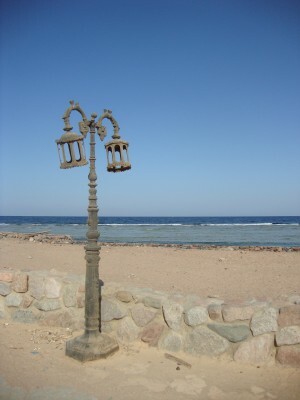 It is worth remembering that until fairly recently Dahab was an isolated coastal village inhabited only by the Bedouin tribes. I know that many people don’t like being ‘hassled’ while on holiday, but to the locals, tourists have money to spend, so it comes with the territory for people to try and sell their wares. Dahab has a very appealing relaxed vibe, you are guaranteed to leave feeling you have learnt something about another culture. For me, it was the perfect destination to take time out from London life, and I definitely plan to go back. While in Dahab we met an American lady in her seventies who was travelling throughout the Middle East, also staying in Bishbishi. Because of the political instability in the region (never mind the general feelings towards Americans in the Arab world) we asked her what travel advice she’d offer for someone wanting to do the same trip. She said, simply: Stick to the locals and be up for an adventure at any turn. Sound advice if ever I heard it.